All transactions are safe and secure with a reliable history in online purchasing behind each of our associates. 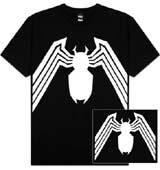 Buy the Spider-Man Venom Logo t-shirt to own Spider-Man clothing and merchandise. Venom is a symbiote alien life form that bonds to a host, usually a human, in order to survive. The symbiote gives the host enhanced powers, creating a super-villain. This dual life form is also referred to by the name Venom. These Spider-Man t-shirts display a white Venom logo. Celebrate the comic book character who can send his enemies running just by showing his sharp teeth and long tongue. In addition to the Spider-Man Venom Logo tee above, browse the Spider-Man Clothing Gallery for more apparel like men's and women's clothes, kids shirts or hoodies.